An interesting bit in שו"ת מהר"ץ סימן יא page תרמד in כל ספרי מהר"ץ חיות ב which explains a mishna in a novel manner. Here is a list of families or people who lived in Second Temple times and apparently hoarded techniques or technological secrets used in the Temple. Since they did not share them they were criticized and the verse the name of the wicked shall rot (Prov 10:7) was applied to them. He could take four pens between his fingers and write a four-letter word at once. The commentators suggest that the four-letter word is none other than the Tetragrammaton. The general thrust of the commentaries is that it's a good thing to be able to write God's name at once rather then to have it partially written at any stage, which is to say, the normal way of writing, one letter after the other. To R. Tzvi Hirsch Chajes (Maharatz Chajes), a 19th century rabbi-maskil, it is obviously impossible for someone to write a word with four pens between five fingers. So he assumed that this Ben Qamtzar had a metal device which he'd ink, enabling him to imprint four letters at once. In other words, he invented printing. And he shouldn't have kept it to himself, the רשע! 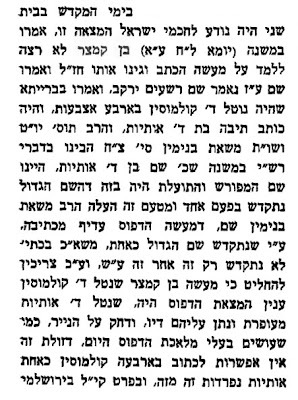 R. Chajes' explanation was anticipated by R. Yonah Landsofer in his בני יונה (pg. י"ד second column), in a discussion about printing סת"ם.